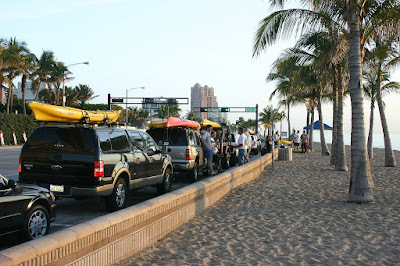 Our dive club - Kayuba - has been launching our kayaks from the north end of Fort Lauderdale beach and going diving on the reefs that are just offshore since 2000! 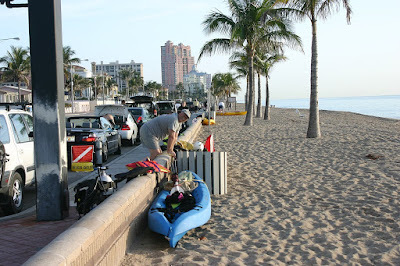 Very few people in the world practice this sport of kayak diving, and very few places in the world accommodate it like Fort Lauderdale Beach. The Fort Lauderdale city council has a vote scheduled for this coming Tuesday, May 1, at City Hall. If it passes, this would effectively close the beach to kayakers. We are desperately hoping that they just don't understand the implications of what they're doing. What they are actually voting on is to put lifeguard stations up at this stretch of beach. That sounds fine. But, the problem is the law that states "No kayaks can launch from a guarded beach." Saturday morning turned out to be perfect for a dive. A picture postcard day worthy of the Chamber of Commerce. You don't have to dive to enjoy kayaking in the ocean. And, you don't have to kayak to enjoy diving from the beach! I dove with Debby in the 80's. She's been a member of South Florida Divers all this time. I'm so excited she just got a kayak, and she'll be joining Kayuba. The biggest question she had was whether she could load the kayak on top of her car by herself. She found this interesting gadget called a Hullivator, with hydraulics to help her get the kayak up and down. Pretty cool! Unfortunately, she couldn't stay and dive with us, so I didn't get to see it in action. When we got back in, we were treated to a rare sight of a group of manatees cruising down the beach. Kayak Diving: Oh Boy, My Favorite! "Blessed are the Flexible for they shall not get bent out of shape." "Blessed are the Impatient for they shall get bent out of shape just enough to do what is otherwise not possible." Ha! I love it! Yes, I agree completely. We must not get SO laid back and flexible that we go nowhere. It reminds me of my favorite philosophy, Taoism. Taoism makes a lot of analogies to water. "Going with the Flow" is another way of saying, Be Flexible. But, there must be positive action. 'Going with the Flow" does not mean sitting on your rear, waiting for something to happen; it just means that in your action, you're flowing with, not fighting against, the universe. If you agree, you might enjoy one of my favorite books: The TAO of Abundance. hmmm - something to think about. One of the main reasons I switched to the new Blogger back in January was for the built-in capability to read the blog the way you read a book - one page at a time, in chronological order from earlier to later. A blog's normal organization is in reverse chronological order. As it should be. You want to always see the the most current entry at the top. Yet, sometimes, you want to start at the beginning and go forward. A lot of people don't know that this capability exists, so I want to tell you about it. The key is to be looking at one individual entry, not the current entries, and not a monthly archive. Click on the heading of a post to go to a page with just that entry. Then, at the bottom, you should see a link to 'Newer Post'. Clicking on that lets you turn the page going forward in time. So, if you've missed a few days ... or a few weeks ... try to find the last post you read and click on it's Title. Then you can keep viewing 'Newer Post' until you're up-to-date. How do you find that last post? Search is a good way. In the upper left of your screen, you should see a box to enter a search term. It will only search the contents of this blog. I have also made a New Video Tour of this Blog to show you around. Check it out. There is also a link to it in the right sidebar under "About the Geeks." Our cell phones are our only phones. Us, and every other full-time RVer we know! We went with Verizon when we first started this lifestyle 4 years ago and we've been pretty happy. We have a national plan with no roaming. That means we can use our phones anywhere in the US, provided there is signal. If we're in an area that would normally work, but incur roaming charges - ours won't work. We don't use our phones that much since 90% of all our communications is via computer. If only Verizon plans had 'rollover' minutes we wouldn't think of switching. Our plan includes 1500 minutes/month shared between the two of us. Often, we only use 400. Occasionally we do go over the 1500, and, boy do those extra charges hurt! Our normal bill is $115/mo. Way too high, in my opinion, for our normal 700 minutes. But, I can't lower the plan because of those 'sometimes' that we go over. We've had $300+ bills when overages apply. "Cingular: I get great service all over central oregon"
"Cingular: This phone works fine in Lapine, but at my house I have to lean against a certain window to get 2 bars. The old TDMA was fine, but when I switched to GSM is hardly works at all. "Verizon: Verizon is horrific in Bend. Treo is impossible to use as it locks up and is worthless. Over 1000 people work at the Bend Airport, but Verizon does not support the area"
"Verizon: My reception is good"
Well, that doesn't help much does it? If you read a lot of these comments, you learn that the particular phone makes a lot of difference as well. We learned early on that having an external antenna like this Wilson Trucker cell antenna, makes a LOT of difference. I think there's even more to learn about cell phones than about Wi-Fi! If you're going thru this process too - good luck! And, let me know what you find out. "Blessed are the flexible, for they shall not get bent out of shape." There's a double meaning here, both mental and physical. In the RV lifestyle, you'd get 'bent out of shape' real quick wthout a flexible mental attitude. We had planned to make a quick stop in Fort Lauderdale, then start heading west. But, now it looks like we're going to stick around for a while. A hard look at our finances, and a desire to spend some quality time with family, makes it logical to stay here for a couple months instead of a couple weeks. Having a flexible mental attitude means that, instead of being disappointed, we're looking forward to doing some diving, reconnecting with friends, and doing a lot of catch-up work. I'm working on our Geeks On Tour tutorial videos . I'm using Coldfusion to put the listing into a dynamic, database-driven web page rather than static HTML. This will open up lots of other options and I can start creating more videos on a systematic basis. I'm excited to have the time to work on this. I'm also putting sample videos on YouTube. They don't look very good there, but, I figure it may be a good promotion. You can get the idea of the video on YouTube (or Google Videos), then, if you want to see the high-quality version - you go to www.GeeksonTour.com. Here's my latest sample. It's on Google Earth. Jim is working in the office here in exchange for our space rent. The minute we showed up in the park, they offered him the job! Flexibility means being open to what comes your way. One of the other things I'm looking forward to is taking some classes with my old Kundalini Yoga teacher. I believe that flexibility is key to physical health. I even have a simple 15 minute yoga routine worked out that I can do in the motorhome. But, I haven't done it in months! I started again this morning. This is a particularly good exercise for me, it's called the Camel pose. Then there's the good ole shoulder-stand. This one really gets that blood and energy flowing between my shoulder blades and at the base of my neck. That's the area that needs the most help after hours and hours at the computer. Good stuff! And, you know what? After working on my physical flexibility, my mental attitude improves as well. Before you go thinking, "Looks like Chris is done RVing, she just wants to stay at one 'home' and live a 'normal' life. That isn't true - what fun is being 'normal?' We are definitely going to be in Oregon this August, where we'll be giving our seminars again for the FMCA convention. Then, in October, we're scheduled to give our seminars at the Datastorm rally in Tucson. I'm really looking forward to getting back out to the west coast. I think it's common for full-time RVers to slow down as the years go by. At first we think we have to cover the whole country right away, then, we start realizing that we have *years* to do this. We can relax and spend more time at each place. And, for us, we have to work on marketing our business ventures (videos, CD's, seminars, Datastorm installs) so we can afford to stay on the road. Ok, back to work! Lynne and John are visiting us for the weekend. We're hoping to go kayak diving, but so far the wind has been blowing too hard to make that possible. When you live and work with the same person in this small box called a motorhome, you relish the opportunity for a different companion. Yesterday, Lynne and I left the boys unattended, picked up my Mom, and had a delightful girls' day out. First came shopping. Blue Water Books and Charts is just an amazing store of everything nautical and I had to show Lynne. It's owned by a friend of mine, Vivien, and she happened to be there, so we also got to chat a bit. When we came out of that store, we noticed Total Wine in the same shopping center. Uh-Oh. I'd heard about this store. 8,000 wines. This stop took a while! Our eventual goal was the beach. We went to the very south end of Fort Lauderdale beach. It ends at the inlet to Port Everglades. Here's a great photo of the port taken by our neighbor in the park, Bryan. He was on top of the big, high-rise condos that line the entrance to the port. View of Port Everglades from atop Point of the Americas condo. Photo courtesy of Bryan. Looking south from Port Everglades. Looking north - Fort Lauderdale Beach. Cool photos, thanx Bryan! We were apparently there at the same time that all the cruise ships depart. We sat on the jetties for about a half hour and saw 4 ships go by. Actually, Lynne and Mom sat on the jetties ... I had to snap a few photos! I don't know where they're all going, but they looked like they were following a well-worn road. Straight east for a while, then take a sharp right. I got an email this morning that is a perfect example of BAD spam. I know that if I clicked on the link in this email something bad would happen to my computer. Most spam is just annoying, but some are actually dangerous. And, the dangerous ones are getting trickier all the time at making it look not only legitimate, but important for you to click on them. Here's the email I got: Looks like something I need to take care of, doesn't it? After all, 'guldsystems.com' is one of my email addresses. If it was suspended I would be very upset. However, since Guldsystems.com is our own domain, and I am the administrator of that domain, I happen to know that there is no such "Guld Systems Abuse Department". (Although Jim has applied for the job. He loves to give abuse! :-) On that count alone, I know this email is bogus. But, what makes it dangerous? If you hover your mouse over the link, you will see a little popup window that displays the 'REAL' link. This is how it works in Outlook anyway - it may not be the same in your email program. What the popup tells me is that, if I click on this link, I will be downloading a file called 'Confirmation_Sheet.pif'. PIF files are 'program information files'. They can hide all sorts of nasties. I don't know exactly what this would do ... and I don't *want* to know! ... but, the most likely possibility is that it would install software on my computer that allows some stranger to use my computer as a 'zombie'. Then, unbeknownst to me, my computer and my Internet connection could be used to send out thousands of spams. It might start by sending itself to everyone in my address book. Not all links in emails are bad. I often send links in my emails as a convenient way for friends to look at something on the web that I'm recommending. It's ok to click on those links. But, if there is *anything* at all suspicious, make sure to hover your mouse over the link and check the *real* link before you click. If in doubt, just go to the web and type in the address yourself rather than using the link. As for the email I received, I'm just going to press the Delete key! If you want to read more, try the Federal Trade Commission, on Zombies, or Wikipedia on zombies , or Wikipedia on Phishing or this recent article in Computer World. As I mentioned in my previous post, one of the advantages of being 'home' is that you can do things like go to a book club at an old friend's house. That's where a group of friends get together for discussions about a book they read. Or, maybe just for discussion - period! Emily and I have known each other since 1983. And, she's been in this same house that whole time. Hard for me to imagine! Isn't her yard luscious? Believe it or not, it used to be a lot more so. Hurricane Wilma did quite a pruning job on it. So, here's home for the time being. We just moved to a new site, right near the pool. I believe summer has arrived. It's 84 degrees in the shade now, and HUMID. We are currently staying at Paradise Island RV park in the heart of Fort Lauderdale. This was the very first park we stayed at - even before our house (that was 5 blocks away) sold. It has it's disadvantages - crowded, traffic, lots of sirens - but it certainly has it's advantages as well. It's less than a mile from my Mom's house and about 3 miles from Jim's Dad. We can see friends, clients, and attend functions almost like we were 'normal' people! I'm going to a book club meeting at an old friend's house on Thursday. I went to a local dog park with Odie yesterday. How fun! We do love our dogs don't we? Because of the camera hanging around my neck, I started talking to one dog-owner about photography. Then that turned into telling him about RVing. He was so full of questions! How do you find RV parks? How much do they cost? What do you do about mail? How long do you stay any one place? What was it like to 'downsize?' When you stay in RV parks all the time, you get to thinking it's 'normal.' Let me out into a city park and I felt like a Hogwarts student out in the land of 'muggles' for a while. Fun. I like feeling 'different.' If any readers out there have ever been to Paradise Island (aka Buglewood), you should recognize the guy driving this golf cart: That's Charlie and he's been here for years and years. He lives in an old Bluebird that hasn't moved for all those years. It's been painted, looks good, but it hasn't moved. Charlie likes dogs more than he likes people. He always carries dog biscuits with him in the cart. It's because of Charlie that Odie learned to accost anyone he sees in a golf cart! This park is completely full during the winter. A lot of folks have been coming down from Quebec every winter for 30 years. We like it in the summer when it's half empty. At least it's supposed to be half empty. This is April 11. Not quite summer yet, but it's definitely not winter anymore. Of the 200+ sites here, only a handful are empty. WiFi Tip: 54Mbps is *not* better than 11Mbps! Here is the Photo Story 3 slideshow I made during our stay at Peace River. All the pictures were taken here. We had a great time this season thanks to all the wonderful staff and guests. If clicking on the window doesn't work, Click Here See you next year! I told Lynne that we are planning to leave Peace River on Saturday and she asked, "Are you excited to get back on the road?" Well, not exactly, no. I usually am excited to start the wheels rolling, but I'm a bit apprehensive this time. We just had such a high doing the seminars at the FMCA convention, but now we have *nothing* on our schedule and I'm worried. Life on the road, when you don't have a retirement income, is a roller coaster Lynne says. Yeah - you can say that again. It's still better than most roller coasters - the highs are SO high, and the lows are still better than most people's normal days. It got me to thinking about when we first started on this journey. I went back and read a few posts from the first blog I started. It kinda seems like we're right back where we started. Only with a lot less savings! It's been on my list for a while to copy the posts from that first blog into this one so everything is in one place. No better time than the present eh? So, I started. I copied the first post in the first blog and pasted it into a new entry here. Then I went to edit the date so it didn't look like it was posted today. Today is 4/5/07 ... that first post was 4/05/03. I didn't plan this ... honest. Anyway - all the old posts are in here now. You could actually go to the very first post and then click on "Newer Post" when you get to the bottom. You could keep reading and then clicking on "Newer Post" for probably 40 hours and read the whole thing! So, here we are. We don't know where we're going, but we're going. We'll figure it out! Stay tuned. I got an email from a blog reader today that brightened my day. His website talks about the RV journey in terms of the Traditional Lakota Vision Quest which is in 3 stages. I think we're embarking on the third stage - good stuff to come! Ha! Be careful what you wish for ... you just might get it! What I wished for is a life where I don't know what tomorrow may bring. Well - I got it honey! Thursday, March 22, Google Earth 275 attendees “Awesome! I am a huge fan of Geeks on Tour.” “All of the Guld’s seminars have been great! Would love to see them @ more seminars. Learned so much!” “Bring the Gulds back. Great! Check it out! Number 4822 on the DatastormUsers map. Andy and Diane are now the proud owners of a Datastorm 2-way Mobile Internet Satellite Dish. First you gotta get it up on the roof. Then you attach it to the roof and pass the cables to the inside of the coach. Jim normally passes them thru the refrigerator vent so he doesn't have to drill a hole in the roof. Next, you connect all the cables to the controller, the modem and the router and get it communicating with the appropriate satellite. Piece of cake! Now comes the hard part. Explaining it all to the inquisitive and proud new owners! And, here's what makes it all worthwhile ... The Blue Light! See Diane and Andy's side of the story on their blog. Welcome to the Datastorm Users club guys! I know you're going to love it. Oh ... and, thanx for the check. Say, why does the signature line say "April Fools"?!? !